The cynodonts first appeared in the Late Permian,when forms such as Procynosuchus already showed mammalian characters in the cheek region and palate and in the lower jaw. During the Triassic, several cynodont families appeared, mostly weasel-sized to dog-sized carnivores, but including some herbivorous side branches. With hindsight, a sequence of nine or ten key steps from Procynosuchus to the first mammals may be discerned through the complex pattern of cynodont radiations (Figure 10.1). Fig. 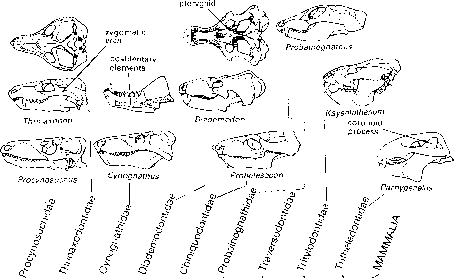 10.1 The evolution of the cynodont skull from the Late Permian Procynosuchus to the Late Triassic tritylodonts, tritheledonts and mammals, showing postulated relationships, based on Kemp (1982), Rowe (1988,1993) and Hopson and Kitching (2001). Synapomorphies: A CYNODONTIA,enlarged nasal bone, frontal excluded from margin of orbit, wide laterally flared zygomatic arches, double occipital condyle, partial secondary palate, enlarged dentary making up more than three-quarters of the lower jaw, adductor fossa on upper margin of dentary behind the tooth row, differentiation of thoracic and lumbar vertebrae, tuber or heel on calcaneum; B, high coronoid process from dentary extends up inside zygomatic arch, maxilla and palatine contact to complete secondary palate; C EUCYNODONTIA,descending flange on squamosal, twisting of dorsal plate relative to trochlea in quadrate, loss of contact of quadrate and pterygoid, dentary symphysis fused, dentary greatly enlarged so that it approaches the jaw articulation, postdentary elements of lower jaw reduced and rod-like, reflected lamina of angular reduced, acromion process on scapula; D,cheek teeth have regular wear facets indicating precise occlusion, contact between palatal processes of premaxillae, maxillae cover vomers in secondary palate; E,bony secondary palate extends to posterior end of tooth row, parietals fused, parietal foramen absent; F,tooth rows inset from cheek margin, partial orbital wall formed from the frontal and the ascending process of the palatine; G, nasal cavity enlarged by posterior extension of secondary bony palate to the end of the tooth row, prefrontal, postfrontal and postorbital bones absent, orbit and lower temporal fenestra confluent, postdentary bones reduced to a slender rod in a deep groove on the medial side of the dentary, dentaries not fused at the symphysis, retroarticular process of the lower jaw elongated and curved and associated with the acoustic system, only three incisiform teeth on premaxilla, shortening of cervical vertebrae, vertebral centra platycoelous, sacrum reduced to two or three vertebrae, scapula elongated between acromion and glenoid, ulnar olecranon process, rod-like iliac blade; H,prefrontal absent, postfrontal absent, separate foramina in petrosal for vestibular and cochlear nerves, fenestra rotunda completely separated from jugular foramen, dentary symphysis not fused. elaborated; and the secondary palate is nearly complete, formed by the medially directed plates of the maxillae and palatines in the roof of the mouth below the nasal passage. Many of these characters relate to an increased volume of jaw muscles, which allowed more efficient food processing, perhaps necessary to sustain a mammal-like metabolic rate. 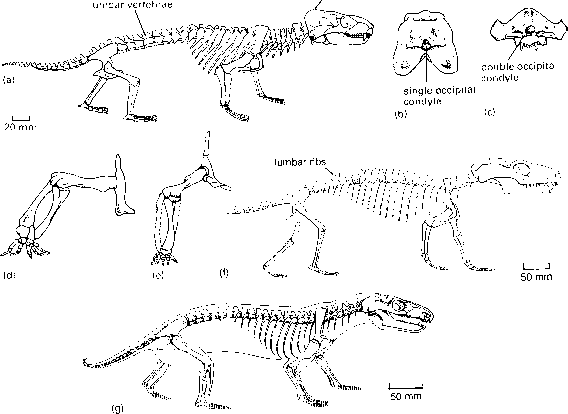 Thrinaxodon shows further major changes towards the mammalian condition (Jenkins, 1971a). It has double occipital condyles (Figure 10.2(a, c)) as in mammals, whereas typical reptiles, including the pelycosaurs, have a single occipital condyle (Figure 10.2(b)). The vertebrae of Thrinaxodon (Figure 10.2(a)) also show mammal-like features. The dorsal vertebrae and ribs are divided clearly into two sets, the 13 thoracic vertebrae in front and seven lumbar, or lower back, vertebrae behind, which have short ribs fused to the vertebrae and the tail is long and slender, much like that ofa cat (Figure 10.2(a)). The main innovations in the hindlimb and pelvic girdle of Thrinaxodon and later forms are associated with a major shift in posture. Pelycosaurs, like most basal tetrapods, had a sprawling posture, with the limbs held out sideways and the belly just above the ground (see pp. 120-5), whereas Thrinaxodon shows a more erect or upright posture with the hindlimbs pulled in closer to the body. This resolved a conflict between breathing and running at the same time that had to be faced by sprawling therapsids, and allowed the effective stride length to increase. The major joints changed their orientation and the shapes of the ends of the limb bones were much altered (Figure 10.2(d, e)). The hip bones are also very different in shape because of major changes in the layout of the leg muscles. The new primary hindlimb retractor was the gluteal muscle, the main component of the human buttocks and not a reptilian feature. The pubis and ischium of Thrinaxodon (Figure 10.2(a, e)) are reduced in size and they extend back a little, and the blade of the ilium is relatively large, especially in front. A second stage in cynodont evolution is represented by Cynognathus, from the lower Middle Triassic of South Africa. The dentary makes up more than 90% of the length of the lower jaw and the bones behind the dentary form a narrow rod that lies in a groove inside the dentary (Figure 10.1). The cheek teeth are fixed in sockets in the jaw and they show wear from processing meat. Cynognathids, and later cynodonts, are classified as Eucynodontia (Figure 10.1), a group that is characterized by a descending flange of the squamosal lateral to the quadratojugal. This flange is already seen in Thrinaxodon, only to be further enlarged to establish a contact to the surangular (Crompton and Hylander, 1986). In addition, eucynodonts show twisting of the dorsal plate relative to the trochlea (the articular surface) in the quadrate. Both these modifications are a prelude to a more 'mammal-like'jaw joint. The exact relationships oftaxa within Eucynodontia are debated (Rowe, 1993; Martinez et al., 1996; Hopson and Kitching,2001). Cynodonts were generally carnivores, but several Triassic lineages became secondarily herbivorous: the diademodontids, traversodontids and tritylodon-tids. These three families have been grouped together as the Gomphodontia (Crompton, 1972; Hopson and Barghusen, 1986; Hopson and Kitching, 2001) as they all share expanded cheek teeth and precise occlusion between those teeth. These features were adaptations for grinding plant food and they are absent in the other cynodonts. Kemp (1982, 1988), Rowe (1988, 1993) and Martinez et al. (1996) have denied the validity of the 'gomphodonts' as a natural group. They argue that their broad occluding cheek teeth are convergences that evolved independently at least three times. The diademodontids from the Lower and Middle Triassic of Africa and South America, such as Diademodon (Figure 10.1), were modest-sized animals. In the palate, the ectopterygoid is tiny. The cheek teeth of Diademodon occlude extensively, the smaller lower tooth forming a deep facet in the broad upper tooth. Occlusion (precise fitting of the upper and lower wear facets; see Box 10.1) is seen in diademodontids, traver-sodontids and tritylodontids, as well as in mammals. This marks a major step forward in terms of the later astonishing differentiation of cynodont and mammal diets. The ability to occlude meant that these animals could chew their food and thus they could modify their tooth types to match a broad range of specialized diets for the first time in tetrapod history. The next stage in cynodont evolution was reached in the Middle and Late Triassic in the chiniquodontids, such as Probelesodon from Argentina. New 'mammalian characters' seen in Probelesodon (Figures 10.1 and 10.2(f)) include the absence of the parietal foramen and a secondary palate that is longer than in earlier forms. There were also further increases in the volume of the jaw muscles. The chiniquodontids were small and medium-sized carnivores that became immensely abundant, especially in the Middle Triassic. They have large heads, a long trunk and a long tail (Figure 10.2(f)). The limbs are short and adapted for rapid movement, and the chiniquodontids could probably have twisted and turned in pursuit of prey as actively as any modern weasel. Is a procynosuchus or a diademodon palate similar to mammals?